Need guidance on proper installation and deployment processes? This guide provides everything you need to know in order to properly install and hydrotest Thermoflex products. Complete the form below and we’ll send you a PDF copy of the guide as a resource for you and your team. The Polyflow team is ready to assist you in selecting the right pipe for the right project. 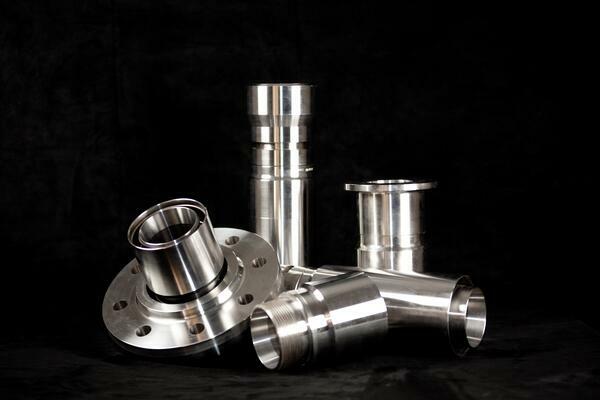 Polyflow’s Thermoflex products are suitable for an array of pipeline applications. Thermoflex® pipe is available in sizes from 2 to 6 inch OD for operating pressures from 275 to 2,000 psi and across a temperature range of 150 to 180F. This pipe can be used for water, oil, and gas applications as gathering lines, salt water disposal lines, gas injection lines, water/CO2 floods and water transport. PE Flex Plus pipe is available in 2 to 6 inch OD, but it is designed for lower operation pressures of 120 to 240 psi and for a slightly lower temperature range of 140 to 180F. This pipe is designed with an ultra low permeation inner layer, required for the transport of oil, gas, condensate, CO2 and H2S, saltwater, brine, and slurries. In addition to the having a variety of service applications, Thermoflex® is a spoolable, low-cost solution for fluid transport, while still delivering the greatest strength-to-weight ratio in flexible pipe. It is able to achieve a high ratio because of its proprietary five-layer reinforcement design. This structure allows the pipe to go beyond the pressures and corrosive conditions of conventional pipe options. Given the wide variety of product options, the Polyflow team is always ready to assist you in selecting the right pipe for the right project. The process begins by listening to our customers describe the project to determine what is important. Then our experts collect some key details to start pipe selection and to develop a plan to deploy it. Polyflow staff can provide guidance to the your functional and engineering teams for overall project delivery. Polyflow experts can participate at a detailed working level as needed. A certified Polyflow technician will be assigned to the project to provide continuity throughout the project. The technicians are available to be onsite for the entire installation operation. Polyflow can provide support from design and pipe selection to deployment and hydrotesting. Polyflow starts with a thorough Project Assessment by evaluating the field conditions, fluid characteristics, and target flow rates. Fully understanding the field, fluids, and flows for the intended design life leads to proper pipe selection. After the Project Assessment is complete, an efficient Pre-Installation stage can occur where many of the logistical activities are mapped out in detail. Some of the key logistical considerations include pipeline storage and transportation as well as site safety. The safety and the integrity of our product and the environment are constantly maintained and HSE standards are applied throughout the project to protect the staff and you. During Installation the pipe is unspooled and sections are joined together for installation. The complete system is then hydrotested to ensure the pipe is ready for operation. During the Pre-Installation period, each operation is executed with the proper level of time and consideration given to personnel and equipment requirements, environmental concerns, and safety. Application Review initiates a detailed assessment. The form requires information on the application type, environment (including terrain and soil, operating parameters), and fluid characteristics. Once the pipe order is placed, Polyflow will fill it on average of 3 weeks. It can then be stored and will be ready for unspooling. While planning the operation a determination is made on the best unspooling method. Prior to the onsite job starting, there will be a Job Safety Assessment and Field Service Check list used to outline all critical steps in the installation procedure. These safety steps are essential for a trouble-free and efficient installation. For greenfield or new applications, Polyflow products can be deployed above or below surface, based on the operating pressure. For applications at or below 500 psi the pipe can either be installed on the surface or buried. For applications at or above 750 psi, full line burial is recommended. 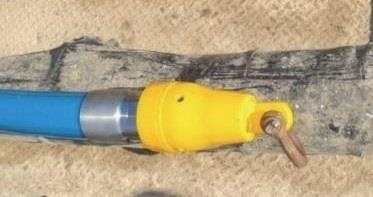 During rehab, a cable or synthetic rope is connected to a pig, so that it can be used to pull the Thermoflex pipe through an existing pipeline. Once installed, the pipeline operator may conduct a hydrotest. The purpose is to test the pipeline in the appropriate substrate at maximum operating pressure to identify any potential leaks before the pipeline is placed into service. The tests are usually performed with water in the Thermoflex pipe at a hydrostatic pressure up to 1.25 times the actual operating pressure for a period of up to 8 hours, this test and can be performed at 1.5 times MAOP, for DOT and hazardous material lines if required. The PE Flex pipe is also tested with a similar procedure. In addition to the Job Safety Assessment (JSA) that was conducted at the start of the installation, another will be conducted specifically for the hydrotest. The tests are conducted for a period up to 8 hours depending on the pipeline product. The operator can then start producing through the system. Once a system is operating, Polyflow offers post project reviews that allow Polyflow experts to recommend adjustments to optimize the system. Thermoflex RT can be deployed in extreme temperature environments. Thermoflex Plus has been designed for sour and corrosive service as well as for fluids that contain bacteria. Thermoflex ECO is best used for fresh or produced water disposal applications and for gas flowlines. No matter the application, the Thermoflex product selected is lightweight and spoolable with a patented layering system comprised of fibers for strength. All of the Thermoflex products offer higher pressure capabilities than HDPE - up to 2,000 psi. They are fast and easy to install because no heavy machinery or welding is required. Given the variety in the product lines, Polyflow has been able to secure onshore and offshore projects around the globe for green and brownfield projects. Case studies can be viewed by clicking here to give a more in-depth summary of the products. Upon reading them you will find that on average our systems are deployed for 1 – 2 miles, but we have plenty of experience with projects that are up to 10 miles in length. Since we can lay pipe in at about 1 mile per day for most jobs, you can be assured that production will start promptly. Polyflow is committed to ensuring that each installation operation is executed with the proper level of consideration given to personnel and equipment requirements, environmental concerns, and safety, so that once the job is complete it will fulfill its design life. The Polyflow team can work with your engineering team to recommend products and guidance through the deployment and operation of your pipeline. The assigned Polyflow representative and Field Technician will work diligently to communicate Polyflow’s best practices and our experience from the thousands of jobs completed in the US and around the world. Reels of 10-ft and 12-ft diameter are shipped horizontally on a flatbed truck. 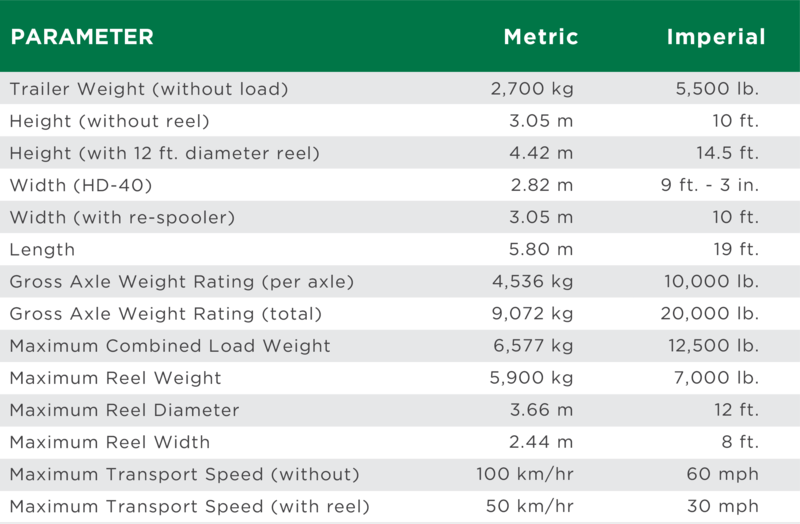 Reels with 14.5-ft diameters are shipped horizontally and require wide load permitting – check local regulations. Reels, either vertical or horizontal, must be tied down with straps or chains. The straps and chains must lie on the cross member of the reel but not directly on the pipe. A minimum of two chains or straps shall be used on each reel to secure it during transportation. A-frames may be used to transport reels on site or hold reels during pipe deployment. A-frames should be designed and fabricated with the capacity to support the weight of reel and pipe placed on it. A braking mechanism shall be in place to prevent reels from free spinning during pipe deployment. A-frames can be mounted on a steel sled for dragging through muddy terrain, flatbed, trailers, or set stationary position on level ground. Attention should be paid to avoid potential kink points. After lifting a reel onto A-frame, the reel should be locked in place with a mechanism, such as a saddle. A-frames can be sourced from a number of vendors or designed for a project. We have a list of experienced vendors we can recommend. Before the operation begins, an onsite a JSA will be conducted and a Field Service Ticket (FST) will be generated. In the JSA a review of all safety aspects will be reviewed daily with the contractor and team in "tailgate" meetings to address all aspects of safety specific to the installation. The FST will be used to keep track of all activities performed on the job including site preparation, deployment, coupling, hydro-testing and other aspects of the job. The customer will sign off on this ticket either daily or once the job is complete. While the operation is being conducted, the operator or contractor shall be responsible for following the actions with the assistance of the Polyflow Field Service Technician. Flow modeling can be performed for greenfield applications to confirm production rates and system velocities for field life. For Rehab applications the pull-through operation is also modeled to confirm the pull forces, select the pulling methodology, and ensure minimum bend radii are maintained. The pulling forces required are based on the length of the pull through, diameter of the pipe, and whether the existing pipe is flooded with water or is dry. Pulling forces must not exceed the maximum allowable pull force of the Thermoflex pipe. If the integrity of the existing pipeline to be rehabilitated is required for the function of the new system after rehabilitation, such as annulus gas collection, then a hydrotest will be required as part of the work scope. Next to planning, having the right personnel on site ensures a successful operation. Polyflow requires that a Polyflow approved and trained contractor or a Polyflow Field Service Technician be present to supervise the installation from site preparation through hydrotest to validate the product warranty. They will ensure that the proper tools, equipment, and personal protection equipment are used to install the pipe safely. They will also review the skill level of all employees on site to ensure the selected deployment method is properly executed. Prior to the job starting at the operation onsite there will be a JSA and Field Service Check List. The Field Service Technician will evaluate whether additional safety related actions are required before beginning the job. These safety steps are essential for a trouble-free and efficient installation. Polyflow can assist with planning the installation operation and can provide additional personnel onsite with the contractor, if desired by the operator. While planning the operation a determination is made on the best unspooling method for onshore deployment, mobile or stationary unspooling. Mobile system unspooling is advantageous because the product will not be dragged across the ground. This avoids potential damage because the tow vehicle can pull the HD-40 series trailer forward as the product is unspooled. Stationary unspooling is recommended when stringing product through areas where the tow vehicle and trailer cannot be easily maneuvered, such as swamp or steep inclines. Storage blocks must be used if the reels are resting on soft ground where the reel flanges sink into the ground causing the pipe to rest directly on the ground. At sites with sharp rocks on the ground, care must be taken to assure that the pipe is not resting on a sharp rock, which could damage the outer jacket. When the deployment requires a stationary A-frame, a suitably powered device, such as backhoes, excavators, winches, is required for pulling the pipe off the reel. The pulling device shall be capable of controlling the pulling force and not exceeding the maximum allowable tension of the specific Thermoflex pipe. Typically, a rope or cable is threaded through a hole in the pipe, tied to a bolt through the pipe, or a pulling cone is used. Polyflow can assist in the design or selection of the pulling device. The stored-energy in the spooled pipe on the reel is significant, thus all personnel must use proper procedures to avoid any rapid release of the stored energy. The pipe will be used in one of two pressure systems that determine the installation method used. For applications at or below 500 psi, the pipe can either be installed on the surface or buried. For applications at or above 750 psi full line burial is recommended. Thermoflex and PE Flex Plus pipe can be installed on the surface in most cases as long as the ground is free of sharp rocks or objects that might puncture or tear the outer cover layer. During surface installation care should be given to ensure that the pipe is not damaged by any vehicle, such as excavators and other large trucks or equipment that maybe present during the operation. Thermoflex and PE Flex Plus pipe can be crushed and damaged if run over. Thermoflex pipe is typically lighter and far more flexible than other RTP products on the market. While flexibility makes it easier for installation, it also requires different techniques and measures for a successful burial installation. The complexity will vary with terrain, weather and environment, number of under-road crossings, and other parameters. One unique characteristic of the pipe after burial is upheaval. When the Thermoflex pipe is buried, the pipeline is restrained from moving in the pipe’s axial direction by friction force between pipe and soil. Under internal pressure, the restrained pipe is under longitudinal compressive force. When the radial constrained is insufficient, the pipe will force its way in a radial direction. For trench buried pipe, there is much less resistance to upward movement once the upward drive force is greater than the radial restraining force. Then, upheaval buckling may occur and cause a critical problem for the pipe. The leading factor in this is poor construction and a lack of compaction. Verifying soil and basic compaction during backfill, (good construction practice for any job) will control this issue. This step is often skipped during construction and is critical on the high stress application. The general process for the installation is to run a cable or synthetic rope through the existing pipeline by towing it with a pig connected to the Thermoflex pipe. The Thermoflex pipe is pulled through the existing pipe. In most cases, it is best to use a lightweight synthetic fiber rope to minimize weight and tension force during the pull through process. Prior to rehabilitating a pipeline, the pipe will be cleaned by conducting a pigging operation. Foam pigs are used in sequence until the line is confirmed clean, that is, when no discharge, residual liquids, or debris seen. The fins on the foam pig are also inspected to confirm that no obstructions exist in the line. Next a “proving” pig is run to confirm that the splice coupling can be pulled through all the bends. The last step is to run the pulling pig, towing the synthetic rope through the rehab. The pull through rate should not exceed 80 ft/min. Thermoflex pipes are joined together onsite with swaged on fitting. Thermoflex pipe fittings and couplings come in the following material options for different internal fluids and installation. Thermoflex pipe couplings and fittings are identified by a permanent marking, including part number and date of manufacture. Polyflow recommends the use of prefabricated risers, elbows, Ys, and Ts for any termination method. The Technician will insert the stem into the pipe bore then a ferrule goes over the pipe’s outer diameter. 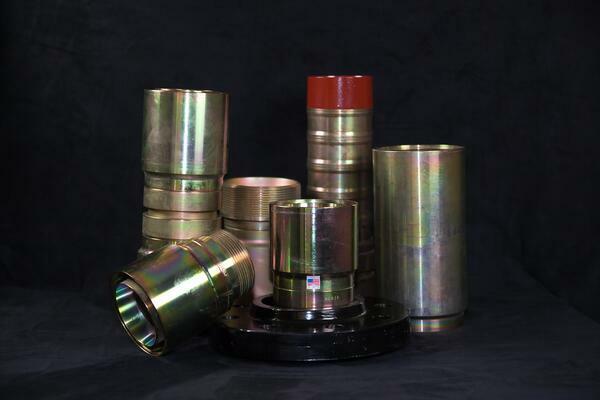 After pipe is inserted into the coupling, the assembly is pushed through a swaging die that compresses the ferrule and anchors the coupling to the pipe. Once all pipe segments are connected, the termination is conducted by the operator. Options are weld neck, flanged, or thread union. The option used is dependent upon company and local government regulations for underground connections. PE Flex Plus pipe can be use joined and terminated by either electrofusion, mechanical couplings, or transition fittings that are commonly used with regular HDPE pipes. The pipeline operator may conduct a hydrotest of the pipeline once it is installed. Pipelines in the US are governed in accordance with DOT Pipeline Safety Regulations Part 192 for Natural Gas or Part 195 for Hazardous fluids. The operator will issue the hydrostatic test procedure to be used on the site. Polyflow has prepared a summary of what the procedure should contain, based on the guidelines listed in Department of Transportation Part 192 (natural gas) and Part 195 (hazardous liquids). 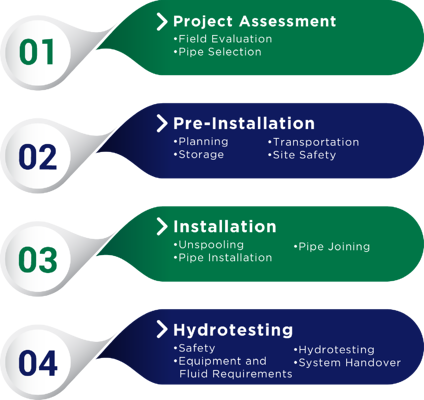 The purpose of the hydrotest is to test the pipeline with the appropriate substrate at maximum operating pressure to identify any potential leaks before the pipeline is placed into service. The tests are usually performed at a hydrostatic pressure that is up 1.25 times the actual operating pressure for a period of up to 8 hours. This test can be performed at 1.5 times MAOP, for DOT and hazardous material lines if required. PE Flex pipe is also tested with a similar procedure. A Job Safety Analysis (JSA) will be conducted prior to the pressure test. The test supervisor will confirm all authorized personnel who will be allowed near the test pipe during the test and the those who will need to be clear of the site. The team conducting the test will be fully informed of the test process and all potential hazards. Care will be given to restraining measures, which may include backfilling, anchoring or any other suitable method as determined by the test supervisor. No point load can be placed on the Thermoflex pipe being tested. The test supervisor will ensure all required documentation (such as signed procedures, permits, valid equipment certificates, elevation chart, etc.) are present, in order, and aligned, including those needed for post-test actions such as water disposal. Due to the danger associated with the test, all authorized personal should maintain a safe distance from the pressurized pipe while monitoring all potential leak points such as couplings, and fittings. The pipe will be tested with the preferred hydrostatic testing liquid: clean water. The section being tested should be completely filled and all trapped air bled off at venting high points or removed with a foam pig. The hydrostatic test is conducted with both the pipe and internal fluid temperature below 110°F. In addition to the pump, other key equipment includes pressure regulators and pressure gauges with capacity between 1.25 and 5.0 times of maximum planned test pressure. The resolution of the pressure gauge will need to be equal to or better than 5 psi, since pressure spikes can occur quickly during the test. Temperature gauges will also be required. A decision will be made to either test the full system or sections of it based on length and volume of line, whether the section of pipe is used to reduce water requirement or limit longitudinal expansion and reduce pressure change during testing. Testing in sections allows for continuation of construction while testing completed lines. In either case the pipeline will be restrained for low stress applications or buried for high stress applications. The tested pipe is secured to ensure that in the event of a leak or failure, personnel and the environment are not harmed by forces such as pipe movement. In preparation for the test, all low-pressure fill lines are disconnected or isolated. The pipe to be tested is then filled with water and all trapped air is bled away. Multiple deviations in elevation may require the use of pigging to remove air. The valve opening and closing sequence will be done in a manner that ensures the prevention of water hammer and the creation of a vacuum inside the pipe. Pressure measurement will be taken at the lowest elevation in the whole test section. When this is not possible, correction to the test pressure must be made for the hydrostatic head. This ensures that the pipe will not be over pressurized. The temperature will be monitored to ensure that large temperature swings do not cause erroneous pressure measurements. For surface installations, the pipe is first inspected for visible signs of damage as part of the pre-hydro conditioning steps. The pipe is repositioned at any location where its expansion during pressurization may interfere with surface structures or cause the pipe to kink. Next, the pipe is pressurized up to target pre-conditioning pressure (𝑃𝐸). The pressure ramp up rate should be no more than 50 psi per minute. The whole line is then visually inspected and repositioned if it has elongated or moved into contact with other structures on site. Pipe rollers can be used to remove slack from the pipe if needed. The pre-conditioning pressure is maintained within +0 psi/-10 psi for a period of four hours. Upon the completion of the pre-conditioning the hydrotest can begin. For high stress application, the Thermoflex pipe is buried. A trench is first fully backfilled and compacted according to requirements in Section 9.4.3 before pressurization. After filling the line with water, the pipe is pressurized at a rate no more than 50 psi per minute to 35% 𝑃E. The line is then locked down by closing valve(s), which insulates it from the pump and other components to hold pressure overnight for 10 to 12 hrs. Pressure is then increased by 100 psi. The pressure and monitored for drop rate is below 0.25% of the current pressure level for 15 minutes. Once stabilized, this is repeated in 100 psi steps until test pressure is reached. The pre-conditioning pressure is maintained within +0 psi/-10 psi for a period of four hours. Upon the completion of pre-conditioning, the hydrotest can begin. To begin the hydrotest, Thermoflex pipe is locked down by insulating it from the pump and other components. If the test pressure remains above the hydrotest pressure, 𝑃𝑇, for an additional four (4) to eight (8) hours with no indication of leakage then a proper installation is verified. The pipe can now be depressurized at a rate no more than 50 psi per minute. If gas is selected as the test fluid, the hold period should be reduced to 1 hour to minimize the effect from temperature variation. The pressure change should also be interpolated with measured temperature(s) of the gas inside. Air/pneumatic testing is not recommended but is safer in the pressure ranges for the PE Flex product. Both should be used with additional caution. We recommend testing all products to 1.25 of Operator MAOP and not to exceed 1.25 of pipe MAOP. You can only perform the test at 1.5 pipe MAOP for DOT applications. Polyflow recommends using the self-loading HD40 reel trailer. Based on our experience with the trailer we have developed safe operating guidelines. This installation guideline has been created to ensure that only trained personnel operate the trailer and that any deficiencies are identified before a job starts. Another key piece of information that should be clearly known before the job starts is the total weight of the load. The weight of the load should be properly summed as the weight of the reel plus the product on the reel and any cargo that is on the trailer. Before the job starts it is beneficial to identify a Spotter to assist the vehicle operator from a remote location to provide clear visibility during loading and unloading. Conduct a general walk around inspection of the trailer. Check for any signs of collision or damage. Check for oil leaks or damaged hydraulic hoses. Check for bent or cracked components. Check the hydraulic power unit engine oil level and cleanliness of the air breather filter. Inspect the tire tread condition, air pressure, and lug nut torque (160 in-lb). Check the axle hub oil level. Check that all lights are operational. Test the trailer disconnect brakes. Start the hydraulic power unit and conduct a function test on all controls. Make note of any irregular operation or sounds. Any deficiencies observed during the inspection should be repaired prior to operation of the trailer. The following is a checklist that must be completed prior to towing a HD-40 series trailer. 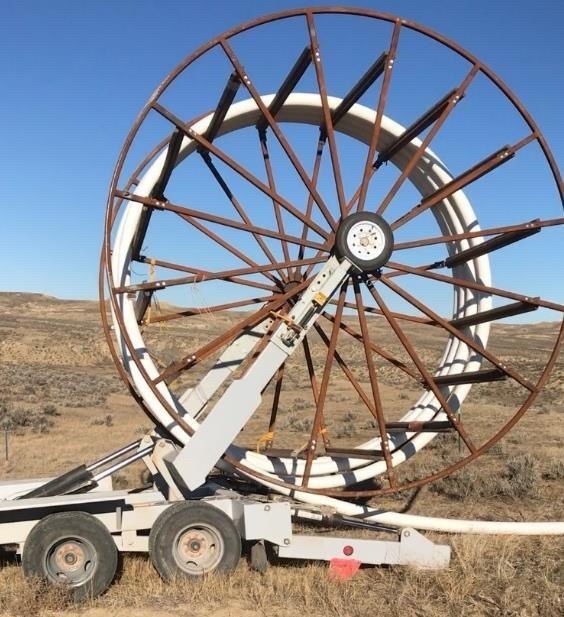 Once completed, a reel can be loaded onto the trailer. Review the trailer model towing specifications found in this manual. Determine and verify the weight of the load. Determine if tow vehicle has sufficient towing capacity to safely transport the combined load of the HD-40 series trailer and reel. 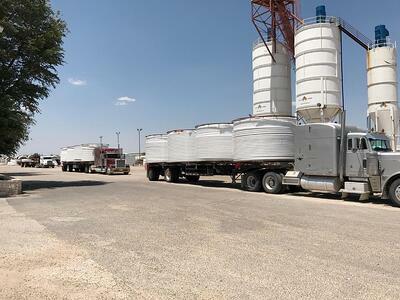 Acquire all appropriate Department of Transportation permits required to transport the weight, height, and width of the HD-40 series trailer and load. Ensure that the tow vehicle has the appropriate hitch and electrical receptacle compatible with the model of trailer being used. Test to determine that all brake and signal lights are in proper working order. Make certain the hitch has been installed properly onto the tow vehicle and is in good working order. Perform a pre-operation inspection of the HD-40 series trailer in accordance with this manual and ensure all deficiencies have been addressed and properly resolved. Make certain the load is properly balanced on the HD-40 series trailer to provide the appropriate hitch weight for the tow vehicle. If you need to plan a project, click the button below to get started. If you’d like to download a copy of this guide, complete the form below.